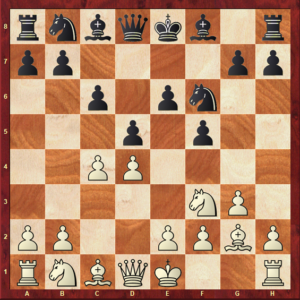 This pawn structure article takes us on a ride to explore the Stonewall Formation, one of the most distinguished and well-known structures in chess. If you have been following these series, you already know that there is a total of seventeen pawn structures in chess, and that a structure refers to the way pawns are placed on the board. The placement of pawns shapes the character of the position – and positions that share a similar pawn structure, share most of their ideas and plans. Therefore, if you study each of these structures carefully and thoroughly, you will soon find yourself with a wide positional chess knowledge, which means you will find your way in any position you come across, and instantly know how to play it. The Stonewall Formation is no exception: there is a lot of chess knowledge hiding behind it, and this article will help you to unveil it. As the name of this structure implies, it is a solid formation which is hard to break apart by force, resembling a true wall made of hard stone. 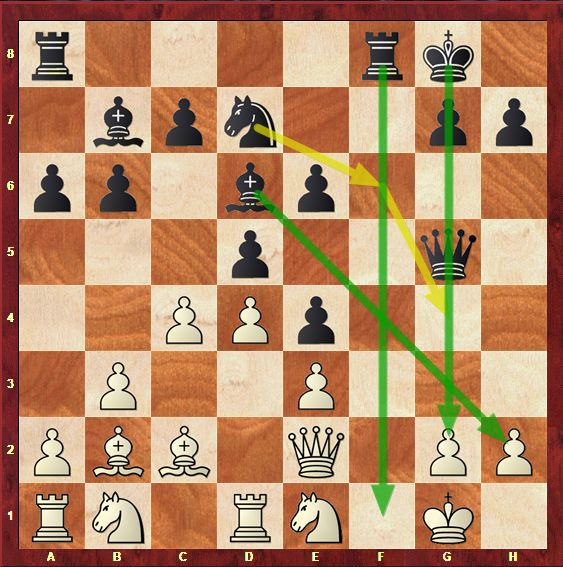 However, it must be said that this structure does not have the best of reputations in the chess world – there are indeed some downsides to this solidity, as you will soon see for yourself. If you are interested in diving deep into the Stonewall Formation, but don’t want to smash your head against it, let’s get started! What does the Stonewall Formation pawn structure look like? Diagram 1a: The Stonewall Formation pawn structure. The first step towards mastering a pawn structure and outplaying your opponent is always to be able to identify it, and that’s what this section is all about. Roughly, the “stonewall” is, as you might guess, built by the pawns on d5, e6 and f5. 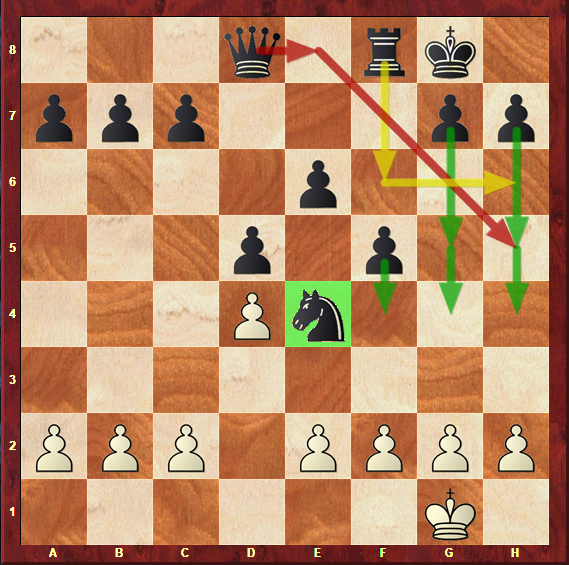 Therefore, this structure is not tied to a single opening, similarly to the Isolani or the Hanging Pawns – it is more of an universal system. Whenever you find this inverted triangle of pawns, you can immediately identify it with the Stonewall Formation – and it occurs in many different shapes. Diagram 1a shows the most common and standard way of picturing this structure, but, in your readings and explorations, you will also certainly come across a position like the one on diagram 1b. Diagram 1b: The Stonewall Formation pawn structure. There is a big guess you can take from looking at the above diagram and comparing the status of this structure as a system to the Isolani and Hanging Pawns structures that we have mentioned before, and it is that the Stonewall Formation can also occur with colors reversed, as pictured in diagram 1c below. Diagram 1c: The Stonewall Formation pawn structure (colors reversed). As much as this is true, please note that it is, by far, much more common with Black than it is with White – therefore, we will refer to Black as the side who has this formation of pawns that composes the “stonewall”, and White as the side who is facing it. We have mentioned in the introduction to this pawn structure that it does not have a good reputation in chess, and this is a true statement. If you have never looked at this structure before, there is certainly something you will find quite odd: that the d and f pawns have advanced to the 5th rank, leaving the e6 pawn behind and, more importantly, the e5 square weakened. Diagram 1d: The weakened e5 square. It is indeed true that this square is left without any pawn defending it, and that, consequently, it is vulnerable and critical in this position. This, and this alone, is the reason why many chess players consider the Stonewall Formation to be an inferior setup, that leaves White with an immediate strategic advantage. The truth is that, in many games, White does have convincing and attractive positional wins against this setup, and that those wins are often portrayed in strategy books as model games. You might feel inclined, at this point, to ask yourself a crucial question: since it appears to be so disadvantageous, why would someone choose to play this setup? The truth is that below its solid, stone-cold surface, the Stonewall is in fact a very aggressive setup. Since Black advances his f-pawn to f5 from early on in the game, as you will soon see, there are many chances for a Kingside attack to be developed. You could think that, since Black is playing f5, his own Kingside is weakened. To a certain extent, that is true. 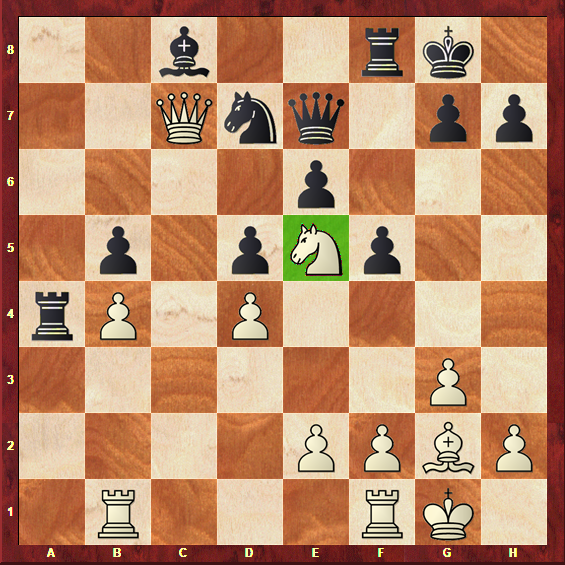 However, the potential for Black to attack is much bigger than for White, in which concerns the Kingside. Black’s setup is solid, and his pieces can proactively defend the Kingside – but the same might not be true for White, as he will have to deal with a pawnstorm created by Black’s f5 pawn together with g7-g5 and h7-h5. In addition to this, as this is a setup that is mainly played against 1.d4, if you are well-prepared in this pawn structure, you will be able to surprise your opponent right from the first moves – and the element of surprise is something that should never be disregarded in chess. As you might know already, things are rarely that easy in chess – it is impossible to claim that the Stonewall is simply bad for Black, because it isn’t true. 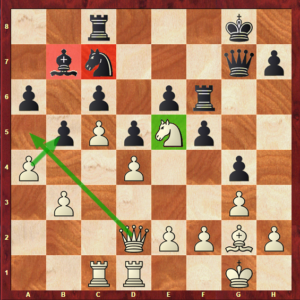 While the e5 pawn is undoubtedly a weakness that Black will have to deal with during the course of the game, this is not the only thing that matters in the Stonewall. 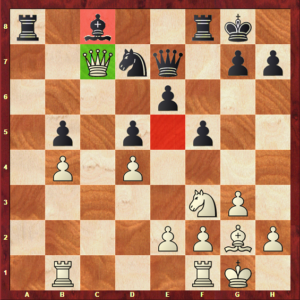 This triangle of pawns constitutes a very solid setup for Black, and, sometimes, even when White occupies the e5 square, the counterplay will be hard to deal with, and the stonewall of pawns won’t be easy at all to break apart. For instance, if White tries to break Black’s pawn structure apart by playing c2-c4 and taking on d5, Black has nothing to be worried about. The f5 pawn can always be defended with g7-g6, and exchanging on d5 with the e6 pawn is a positive outcome, as Black gets rid of his backward pawn on e6. Having read this section, you will be able to identify the distinguished shape of this structure in the blink of an eye – but this, alone, is not worth much. We are now moving on to deeper considerations about the Stonewall Formation throughout the next few sections, so make sure to stay focused. When you are studying pawn structures, your aim should be to master that kind of position – and after you study all seventeen structures, you will quickly improve in chess. However, knowing how to identify the structure, as we did in the previous section, is only the first step. From now on, we are going to approach the real deal: what the Stonewall Formation pawn structure is really all about. Each position has its essential features and characteristics, and this pawn structure is no exception. First of all, as we have mentioned earlier, the fact that the e5 square is weakened is one of the main characteristics of the position. White will fight for the firm control of this square, and aim to place a strong piece in there, namely a Knight. This square is not only undefended, but also crucial as it stands in a privileged position, in the centre of the board, and as it blocks Black’s backward e6 pawn. In chess strategy, a backward pawn is a pawn that is left behind as the adjacent pawns advance, and it is typically weak. An effective way of targeting this weakness is by blocking it with a Knight. As you may already know, Knights are the perfect pieces for blockading, as they can jump over other pieces and pawns, and, therefore, aren’t less effective when their function is to block. Take a look at diagram 1e for a representation of this idea. 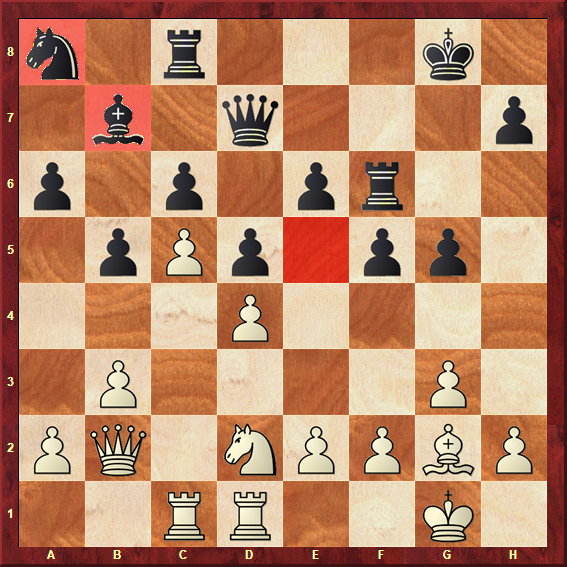 Diagram 1e: White’s blockading Knight on e5. 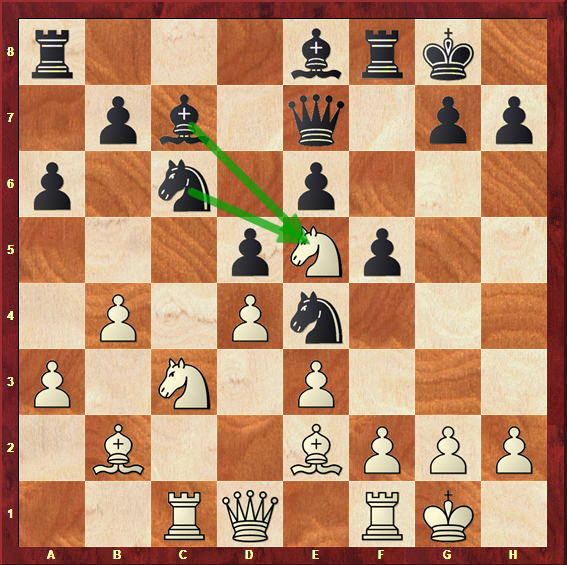 A controlling position with a Knight on e5 is what White aims to achieve. 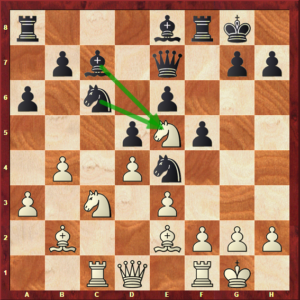 However, Black can often allow this and proceed with his counterplay ideas, such as placing a Knight on e4 himself, launching a Kingside attack or a breakthrough on the Queenside. For instance, Black’s Kingside attack, as previously mentioned, has a lot of potential. Since the pawn is already standing on f5, the most logical way to continue the attack is by launching a pawnstorm. That means advancing the g and h pawns further, trying to breakthrough and weaken White’s King in a significant way. 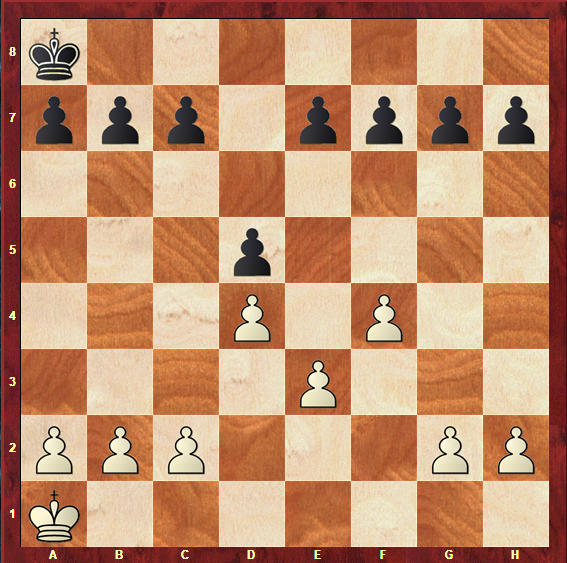 However, Black’s pieces also have an important role in the attack. The Knight, for instance, stands very well on the e4 square, supported by the f and e pawns. The Rook can be able to join the attack with a Rook lift, via the f6 square, and the Queen is also only a few tempi away from doing so, using the e8 square to jump to g6 or h5. Take a look at diagram 1f for a visual representation of Black’s attacking chances. Diagram 1f: Black’s Kingside attack ideas. Another reason behind the bad reputation of the Stonewall is Black’s bad light-squared Bishop. Since this Bishop’s home is the c8 square, the pawns that constitute the “stonewall” limit its actions and movements. Diagram 1g: Black’s bad light-squared Bishop. Exchanging this Bishop for White’s own light-squared Bishop would, therefore, be a great improvement for Black – or getting it out of the chain in order to place it in more active squares. This is one of Black’s main plans in the position. It must be noted, though, that in some games Black may triumph in his Kingside attack or Queenside breakthrough without this Bishop even seeing the light of day – as always, it depends on the position, and you will see that for yourself once we start analyzing games in this structure. 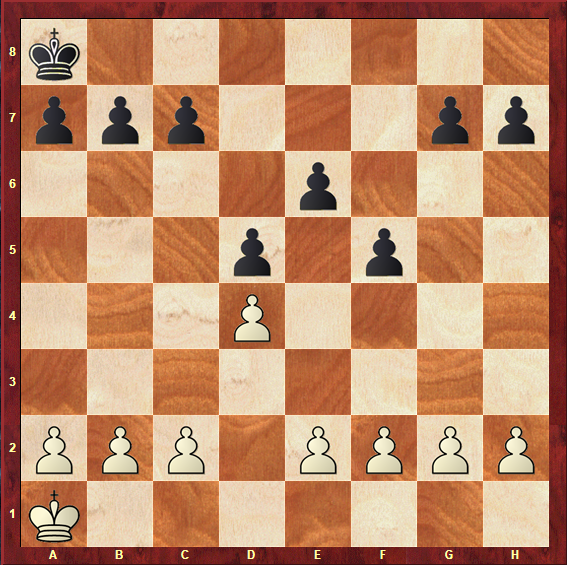 Diagram 1h pictures the maneuvers Black can carry out to activate or exchange this Bishop in this pawn formation. Diagram 1h: Routes of activation for Black’s light-squared Bishop. Bringing the Bishop to the Kingside, where it may even help the attack, via d7-e8-h5, is, by far, the most common plan on the Stonewall. However, placing it on a6 after the move b7-b6 is also an interesting plan, perhaps more aimed at the exchange of the Bishops than its activation in itself. Another rather rare, but possible idea of freeing this Bishop is to be able to play e6-e5 at a certain point in the game. 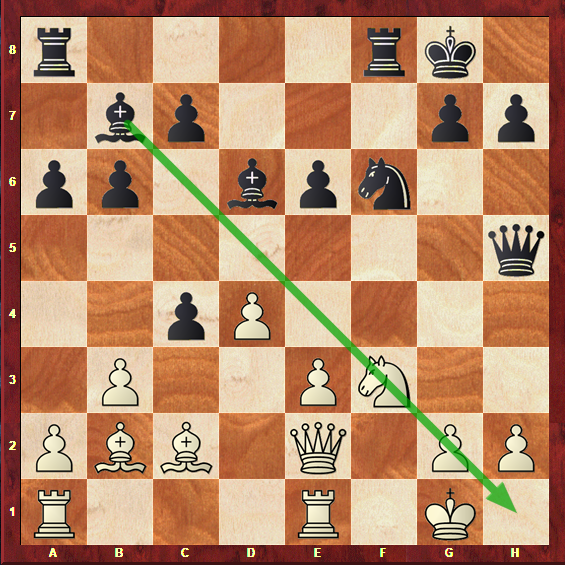 Please note that this can only happen when White’s c-pawn is not attacking d5, either by having been pushed to c5 or by still being on the c2 and c3 squares. By playing e6-e5, Black is able to free the e6 square for the Bishop, which is truly ideal in the Stonewall, as, at the same time, he gets rid of the backward e6 pawn. Beware of this idea, as many unprepared opponents can allow it to happen on the board! From reading these two sections of the article, you might feel inclined to agree with all of those who say that the Stonewall Formation is no good for Black. It’s true that Black has to deal with a backward pawn, a weakened central square and a bad Bishop, and that it is hard to find what is good about his position – and that the Stonewall is not to every chess player’s taste. However, the next section will show you exactly which aces Black has up his sleeve to counter White’s naturally stronger position, and how he can fight for a win in this pawn structure, presenting strong and convincing arguments. If you don’t want to miss it, keep on reading! If you have read any of our other pawn structure articles before, you are already familiar with how important this section is. It is the section that will teach you the plans for both sides in the Stonewall Formation pawn structure. To illustrate those plans, we will analyze games that have been played by the world’s leading experts in this structure, so that you can learn from their experiences and apply the knowledge in your games. If you can’t wait to master the Stonewall Formation, let’s get started! First of all, we are going to look at the board from White’s point of view. If your idea is to play this structure with the White pieces, this section is crucial. If, on the other hand, you want to be all the way across the board – stick around, because your section is coming up and because you will certainly want to know what your opponent is planning on doing. Being on the White side of the board and playing against the “stonewall”, built by Black, is definitely a challenge. Even though this setup’s reputation seems to indicate that it is far easier to play it with the White pieces, we should be careful when making these assessments. First of all, fighting against such a solid pawn formation is rarely easy, and the nerve to slowly build an advantage, without losing either focus or patience, is required. In addition to this, many players are inclined to feel as if they should “punish the Stonewall”, which is an overly aggressive and certainly somewhat dangerous way of thinking. All of this being said, White’s plans are quite straightforward: to exploit the weaknesses left by the Stonewall pawn formation. As you already know, one of those weaknesses is the e5 square, and one of the problems left by this structure in Black’s position is the passive and limited light-squared Bishop. Therefore, those are two faults that White will strive to exploit, trying to turn them into a serious advantage. Let’s start by looking at a game in which White managed to reach the ideal version of a Stonewall Formation pawn structure. 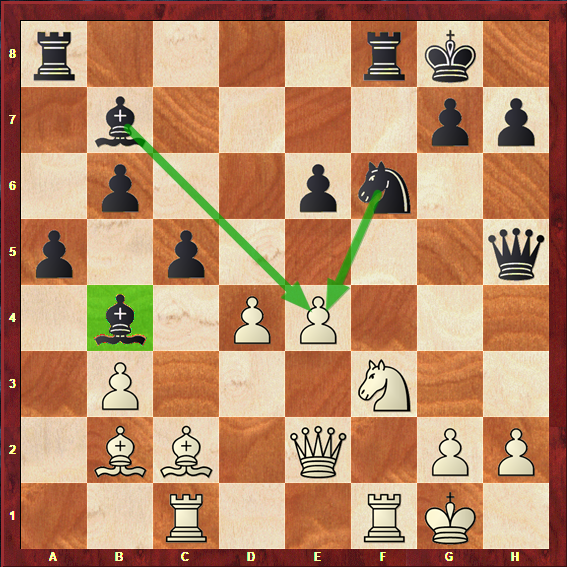 This game was played in the Golden Sands Europe Open of 2013, between Sandro Mareco and Chithambaram Aravindh. Diagram 1i: Mareco – Aravindh, 2013: Position after 18.c5. We pick up the game on move number 18, in which White has just pushed his pawn from c4 to c5. Looking at this position, it might not be hard to understand that White has a great advantage already. The move c5-c4 leaves the b6 Knight in great trouble, without any good squares to reach. It can be said that it will keep the b7 Bishop good company, as it, too, is a highly limited piece, stuck behind all the pawns standing on light squares. 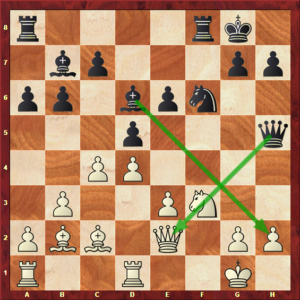 As the position is closed on the Queenside, the only hope that would remain for Black would be to generate play on the Kingside – however, that will be difficult with such a discoordinated army of pieces. Another advantageous factor for White is the way the Bishop, Queen and pawn control the crucial e5 square. Later on in the game, you will see how White manages to fully control that square, and, consequently, the position. Diagram 1j: Mareco – Aravindh, 2013: Position after 21…Rxf6. Behind White’s last move is a fundamental idea that turns into a plan: to exchange dark-squared Bishops. 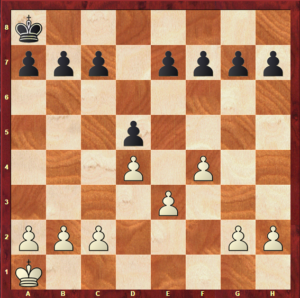 The truth is that Black’s dark squares are highly weakened with the pawns standing on light squares in the Stonewall formation, and the Bishop is an effective defensor – therefore, White attempts to exchange them to make these weaknesses even more evident. In addition to this, the e5 square is a dark square. By exchanging Black’s dark-squared Bishop, Black is also losing potential of fighting for this square, and White may come closer to its full control. Diagram 1k: Mareco – Aravindh, 2013: Position after 25.a4. White’s advantage is simply enormous in this position. Note how limited Black’s minor pieces are, marked in red on the above diagram. Also, as you can see, the e5 square is now under complete control by White, and there is no foreseeable way for Black to fight for it, for the time being. 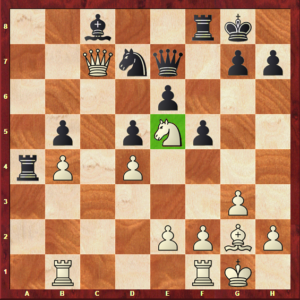 Having the full control of the position, White decided to breakthrough on the Queenside with a2-a4; this has the objective of provoking further weaknesses in Black’s pawn formation. Undoubtedly, this is the kind of game in which Black suffered a lot and never got the chance to actively discuss the result of. It must be noted, though, that certainly play was not the most accurately, and that this should be regarded as an example of how not to play the Stonewall with the Black pieces. This game allowed us to take a great sneak peek at White’s plans: controlling the e5 square, exchanging dark-squared Bishops and expanding on the Queenside. These are indeed the basic ideas behind White’s position – but let’s take a look at one more game, in order to confirm them and see them put to a different practical test. The game we are going to analyze took place in the Norwegian Championship of 2013, and was played between the Grandmasters Jon Ludvig Hammer and Rene Djurhuus. Diagram 1l: Hammer – Djurhuus, 2013: Position after 14.Bg5. 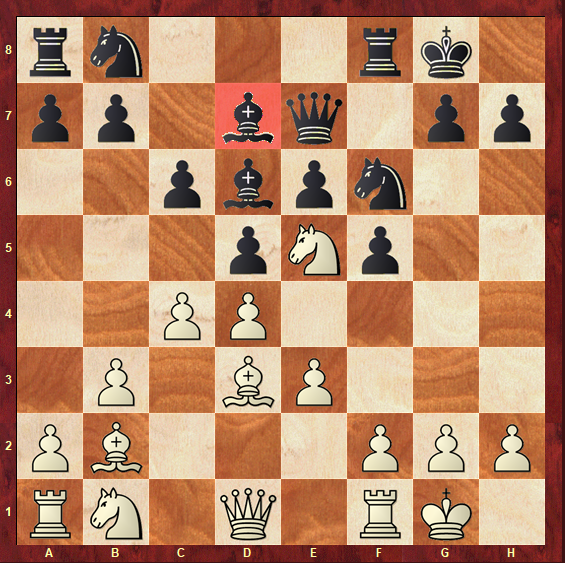 We start following the game on move 14, in which White has brought the Bishop out to g5, attacking the Queen. Please note how the expansion on the Queenside has already taken place, via a2-a3 and b2-b4 – Black, in return, replied with b7-b5, in order to avoid the full control of that area of the board by White. This does, however, leave his position with different kinds of problems. One of them is, as usual, the light-squared Bishop. Diagram 1m: Hammer – Djurhuus, 2013: Position after 17.Qc7. In a quick and effective way, White manages to take the dark-squared Bishops off the board and invade down the c-file with his Queen. Having carried out both of these plans, there is only one more thing to do when you are playing the Stonewall formation with the White pieces: naturally, to occupy our beloved e5 square. Diagram 1n: Hammer – Djurhuus, 2013: Position after 18. Ne5. And here it is: White’s dream position in the Stonewall formation has been reached. The Knight is on e5, the dark-squared Bishops are nowhere to be found, and White has managed to create play on the Queenside, namely by invading down the c-file with Her Majesty. Certainly, White’s plans look as effective as they are natural. However, you must keep in mind that you are never playing chess on your own. There is always an opponent sitting across the board, hoping to put a word in for himself and carry out his own plans and ideas – and that’s exactly where we are headed now. As you have read earlier, the Stonewall is not for everybody. Playing it with Black, particularly, is a challenge that only solid, well-established and resilient chess players will be able to take. That being said, the Stonewall offers many interesting possibilities for Black. 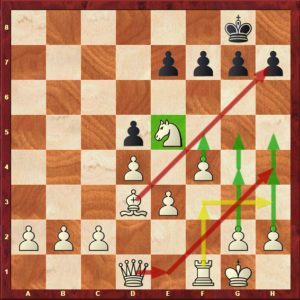 If you are not convinced about it, after hearing the rumours and reading the section in which we covered White’s plans, stick around for a little bit longer and get ready to discover many thrilling ideas. First of all, having advanced the f-pawn already, one of Black’s ideas is indeed quite straightforward: to checkmate White’s King. For that, pieces and pawns will travel to the Kingside, organizing themselves in order to create a deadly attack. Our first game, played in the Livigno Open of 2010 between Emilio Cordova and Igor Naumkin, shows how Black may have high chances of playing for direct checkmate threats. Diagram 1o: Cordova – Naumkin, 2010: Position after 11…f5. Black has just pushed f7-f5 to enter a favourable version of the Stonewall. 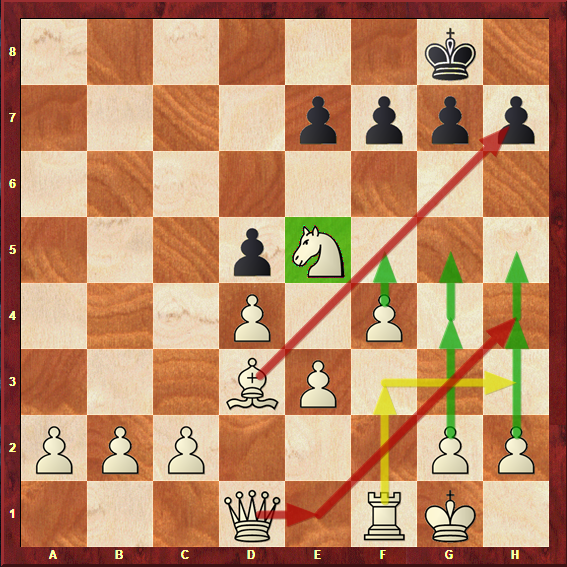 Well, first of all, the Knight is already standing on e4, and the move f5 will help to secure its strong central position. In addition to this, the move dxc4 is always a possibility, in which case the Bishop on b7 – usually a piece Black will have to lose sleep over – becomes a very strong piece, placed in the long diagonal and looking straight at White’s King. Seeing that Black’s Knight was indeed powerful, White played a somewhat hasty move – and ended up being punished for it. f3 Bd6! sacrificing the Knight. Diagram 1p: Cordova – Naumkin, 2010: Position after 14…Qg5. Black sacrificed a piece, that’s a fact. 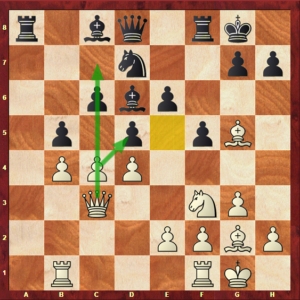 But look closely at the position to realize all of what he got in return: an open f-file to attack along, an open diagonal for the dark-squared Bishop towards the King, and a possibility for pieces to invade the Kingside very quickly – as the Queen has already done. 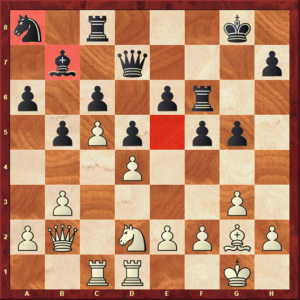 Despite being a full piece up, White does not have an effective way of defending against Black’s rapid threats. One of them is the direct Nf6-g4, adding one more piece to the attack. Considering all of this, White decided it was time to give up the extra material in order to try to defend against all of Black’s threats. Diagram 1q: Cordova – Naumkin, 2010: Position after 17…Qh5. 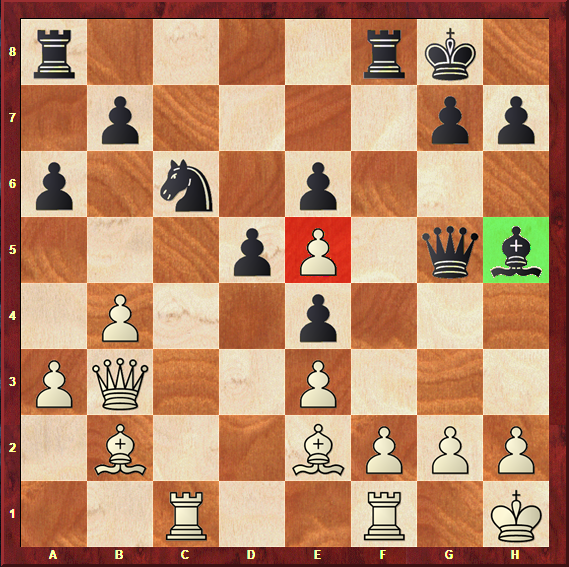 A renewed threat is in the horizon: Black is planning on playing Bxh2+, as the f3 Knight is pinned to the Queen. Even though White decided to give back the piece in return for a more organized defense, the threats are still coming at him in all shapes and sizes. Diagram 1r: Cordova – Naumkin, 2010: Position after 18…dxc4. Even the “bad Bishop” of the Stonewall unleashes itself, and forces White to give up a pawn in order to block it. With the extra material, Black has no need to keep playing for the attack, and can work on stabilizing the position. Diagram 1s: Cordova – Naumkin, 2010: Position after 22…c5. 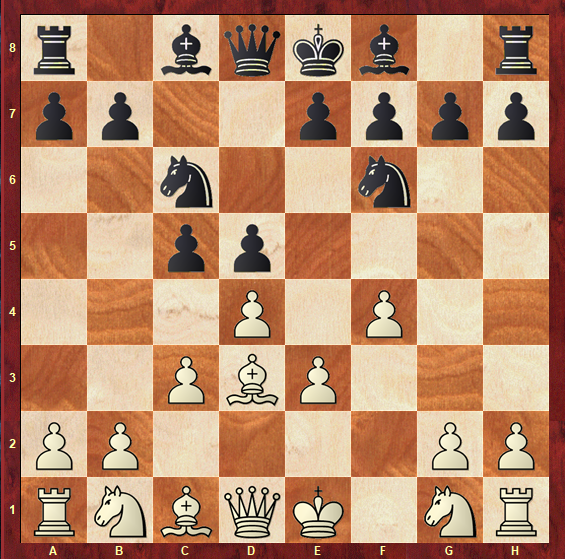 Black defies White’s central control with c7-c5, a move that also supports the strong light-squared Bishop on b4. With the stabilized position, Igor Naumkin, playing Black, has a huge advantage, being a pawn up and having superior piece placement. He went on to win the game a few moves later. Moving on, we will go back to the idea of a typical Stonewall bad Bishop in order to learn how Black is able to actively insert it in the game. We are going to analyze a game played between the well-known top Grandmaster Levon Aronian, from Armenia, and the Russian Grandmaster Evgeny Tomashevsky, played in 2013, in the World Cup. Diagram 1t: Aronian – Tomashevsky, 2013: Position after 9…Bd7. Since we pick up this game at an early stage, right on move 9, it is normal that the position on diagram 1s looks like a normal Stonewall setup, and it indeed is. 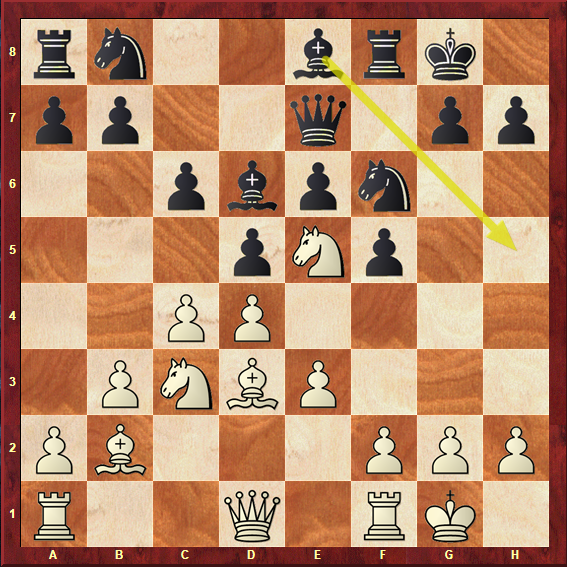 The key point of this game is to see how the light-squared Bishop can go from zero to hero – from Black’s worst piece to a crucial and advantageous element. Diagram 1u: Aronian – Tomashevsky, 2013: Position after 10…Be8. This is the maneuver that enables the activation of the Bishop: from c8 to d7, to e8 and finally to h5. It must be noted, however, that the Bishop remained on e8 for quite a long time now – it was only unleashed to h5 when the right time arrived. Diagram 1v: Aronian – Tomashevsky, 2013: Position after 13…Bb4. White’s pieces are highly discoordinated, with a Knight being on b5 away from the purpose of the game, and the Bishop on b2 being worse than Black’s usual bad Bishop, locked in by his own pawns. Diagram 1w: Aronian – Tomashevsky, 2013: Position after 17…Bc7. Black’s pieces achieve a setup of perfect coordination, namely between the Knight on c6 and Bishop on c7 putting pressure on the central e5 Knight. 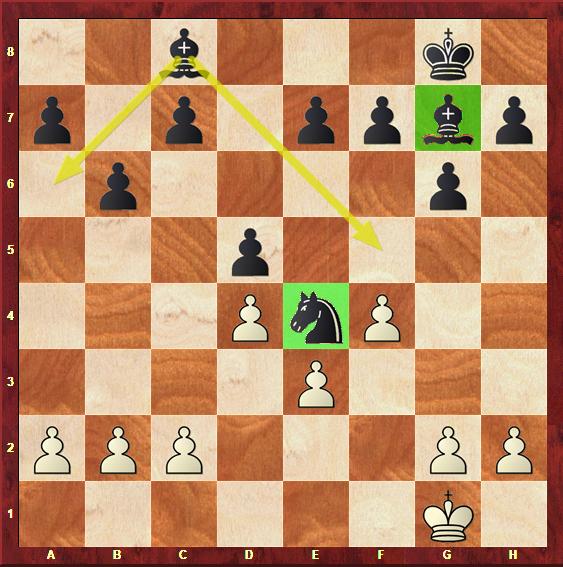 Diagram 1x: Aronian – Tomashevsky, 2013: Position after 21…Bh5. Finally, the Bishop reaches the final stage of his activation process. 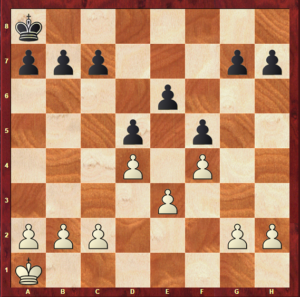 And Black’s advantage keeps on growing – the e5 square is occupied by a weakness instead of the strong, supported piece White wanted to have there, and Black’s pieces are simply in great squares, coordinating perfectly with one another – while White still has a bad Bishop of his own on b2. Tomashevsky, with Black, went on to win one of the most important games of his career due to the so-called bad Bishop of the Stonewall – makes you wonder why its reputation is so bad, after all! Let’s now sit down and write down a few ideas, in order to take in all of the information we have just learned. Soon enough, you will be able to apply these plans in your own games in the Stonewall Formation pawn structure. At this moment, you are very close to being a master of the Stonewall Formation pawn structure. However, there is one question that you still need to find the answer to, and it is how you will be able to find your way to this structure on the board – and all of this knowledge is coming right ahead! Before you get the chance to outplay your opponent whenever you find the Stonewall Formation on the board, there is still one thing you need to figure out: how, exactly, can you reach this pawn structure? Simply placing the pawns on d5, f5 and e6 does not work against every single move that your opponent makes – so you really need to figure out which openings to play in order to come across your favourite structure. First of all, remember that we said that this structure is a setup, which means it is not rigidly tied to a single opening, and that it can happen with colors reversed. Diagram 1y: The Stonewall Attack. The Stonewall attack is an interesting opening to discuss, because it is very aggressive. Just like Black’s plans on the Stonewall Formation pawn structure that we have just covered, White aims to achieve a direct Kingside attack. 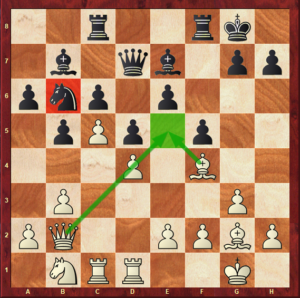 For that, he mirrors the placement of pieces we have seen in diagram 1f: a Knight on e5, pawns from g2 and h2 to g4 and h4, a Rook lift via f3, and a Queen using the e1 square as a launching pad into the attack. 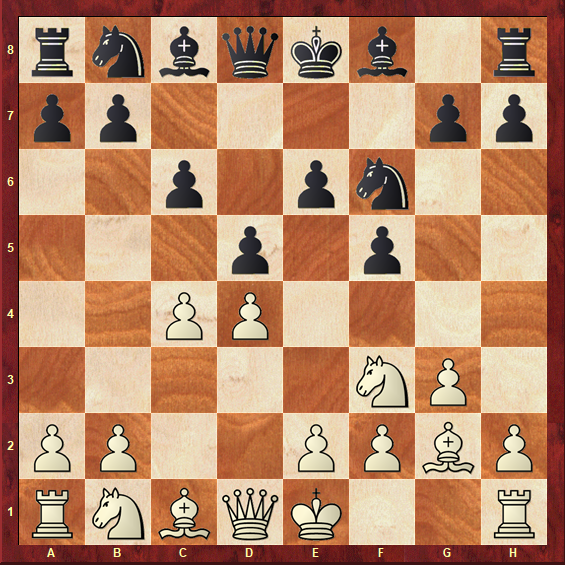 As everything is mirrored in this structure, please note that White’s c1 Bishop is a bad piece in this setup – however the light-squared Bishop can use the d3 square to look at the Kingside in the sharpest of ways, threatening potential sacrifices all along. Take a look at diagram 1z to see White’s attacking chances in the Stonewall Attack. Diagram 1z: White’s attacking chances in the Stonewall Attack. As we have seen before with Black, White can also try to breakthrough in the centre and play on the Queenside, namely with c2-c4. 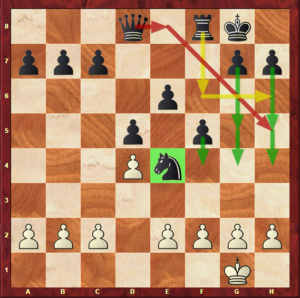 That being said, it is far more common to adopt a strategy of attacking on the Kingside, as is deeply in the nature of this pawn structure. The Stonewall Attack, of course, comes with all the drawbacks as well. 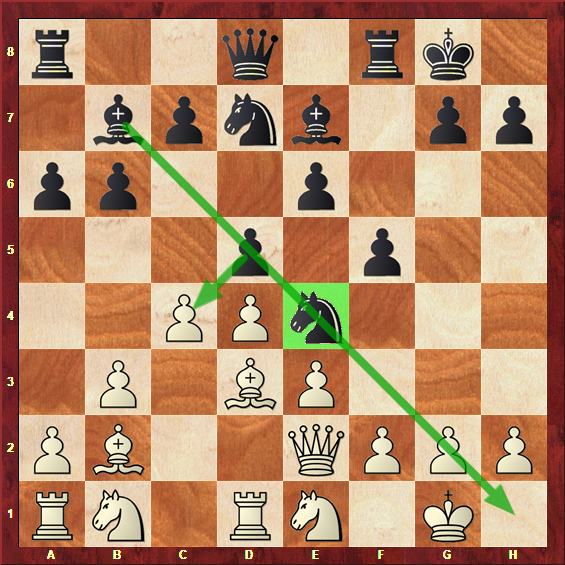 The e4 square is also vulnerable, and Black will try to achieve a controlling position against this setup, by placing a Knight there. A way to effectively meet this setup is by playing an early Bc8-f5, controlling the light squares and stopping White’s plan of placing a strong attacking Bishop on d3. Black can also develop the light-squared Bishop on the Queenside, by playing b6-Ba6, aiming to exchange light-squared Bishops in order to weaken the central squares even further. Again, this is similar to White’s strategy when Black plays the Stonewall setup, as we have seen: to exchange dark-squared Bishops. There is also a possibility of playing g6-Bg7, with a Kingside fianchetto, in which the dark-squared Bishop will have two important roles: protecting the King, and controlling central squares from a distance. Diagram 2a shows Black’s chances to play actively against the Stonewall Attack. Diagram 2a: Black’s positional chances against the Stonewall Attack. 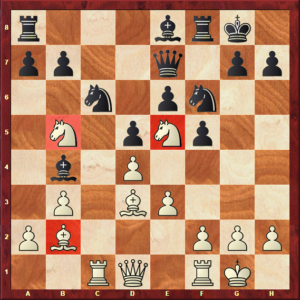 When it happens with colors reversed – as is most common – the Stonewall setup is a variation of the Dutch defense (1.d4 f5). Diagram 2b: The Stonewall Variation of the Dutch Defense. These are the two primary ways of reaching a Stonewall pawn structure right from the beginning, varying in move orders. Keep in mind, though, that the Stonewall is a system. At times, mostly in closed games (those that start with 1.d4), the position may come to a Stonewall Formation at a later stage of the game, namely in the middlegame. Therefore, you might want to keep your eyes peeled, as the possibility of facing the Stonewall remains even after the first few opening moves are gone! Now that you know all there is to this structure, let’s take a brief moment to break it down to a few points, so that you can remember everything as easily as possible. And so it is – the end of another pawn structure article has arrived! You are definitely to be congratulated. With this article, you have one more pawn structure to add to your collection: the Stonewall formation. As you might have understood from reading the article, this pawn structure is quite characteristic and distinguished in itself. The pawns are presented in an uncommon way, that means to be solid, but, of course, also has its drawbacks. 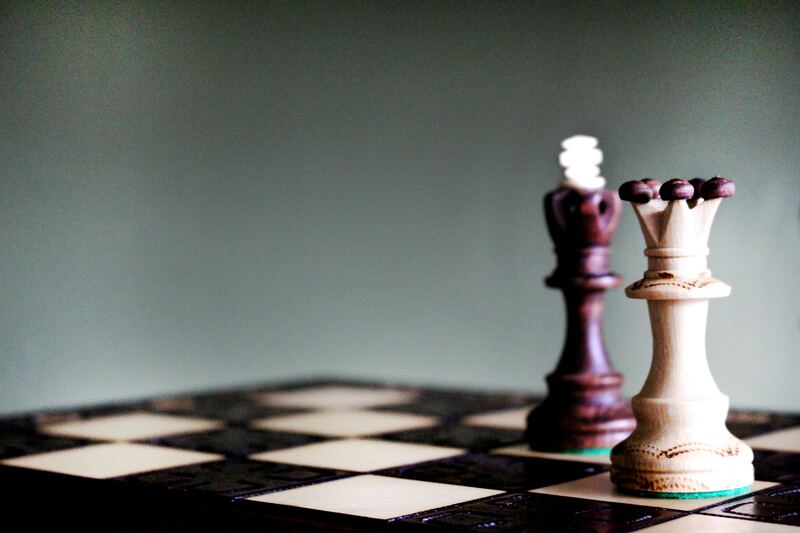 In the end, everything in chess comes down to personal taste; but the truth is that with this article, you have the tools to play this structure masterly on both sides of the board! 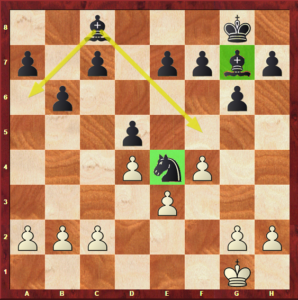 Here you are – a master of the Stonewall Formation pawn structure! This might be a good time to sit in front of your computer or wooden board to play a few practice games in this structure. If you don’t feel like practising, remember you can always check out one of our other pawn structure articles, and come even closer to mastering all kinds of chess positions out there.